Re-opened by Lord Ardilaun in 1880 for the citizens of Dublin it has been maintained in the original Victorian layout with extensive perimeter tree and shrub planting and spectacular spring and summer Victorian bedding. There are over 3.5 km of pathways to stroll around the park to view the plants & flowers, rock work, an ornamental lake - which provides a home for ducks and other waterfowl and a number of sculptures which are located throughout the green. 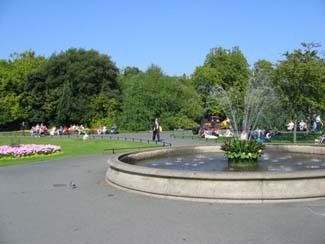 There is also a children's playground and lunchtime concerts are performed during the summer months. Gardens Open: Mon-Sat 7.30am, Sun and Holidays 9.30am. Close at dusk.